Available in 125ml impulse and 500ml take-home sizes, available to order now. The completely biodegradable tubs were designed with the help of the fantastic team at Ark Creative, who also developed the revamped new logo in 2018. The 125ml tubs include a handy spoon under the lid and are colour coded for easy storing and serving. 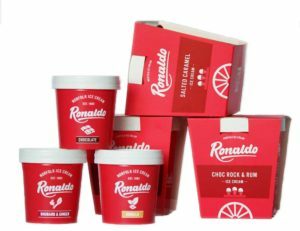 The 500ml tubs come with an eye-catching outer sleeve, referencing our traditional ice cream barrows. For trade customers wishing to take a look at the new tubs before they order, samples are available on request. Just fill out our simple request a sample form or contact us in the usual way and we will arrange for some to be sent to you. We have point of sale items available for traders wishing to stock our retail range – just ask.